Just one day after U.S. President Barack Obama hosted leaders from across Africa, African Americans exploded in rebellion in Ferguson, Mo. A series of lawsuits have been filed against the city of Ferguson charging police misconduct and brutality during the demonstrations in response to the police killing of Michael Brown. Six plaintiffs have filed federal court actions against the authorities in Ferguson and St. Louis County. The litigants are claiming they were arrested without cause, beaten and verbally abused by both local and county law-enforcement officers. “This is a blatant example of how police handle African Americans … how it can go terribly, terribly wrong. You have a right to peaceful assembly,” lamented Reginald Greene, an attorney in one of the cases. Mass demonstrations organized in the aftermath of the brutal killing of Brown resulted in further acts of law-enforcement misconduct and brutality. 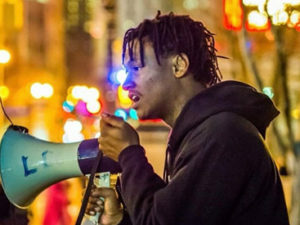 The protests demanding justice for Brown were covered nationally and internationally. 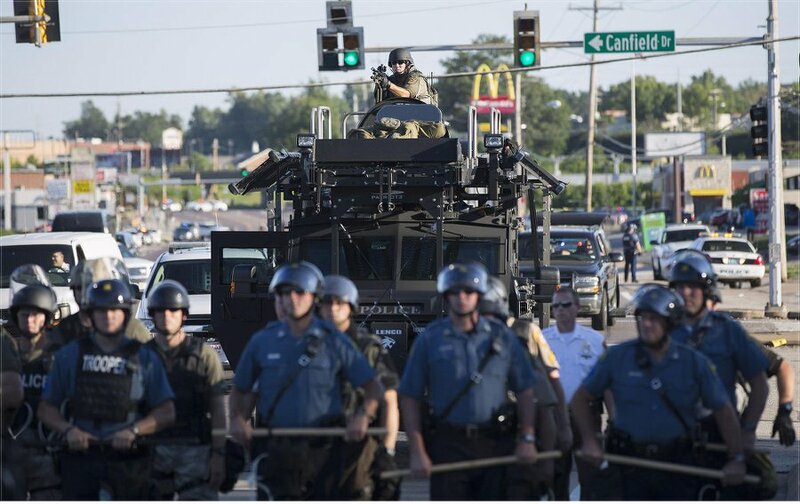 CNN, Al-Jazeera America, Press TV, Russia Today, the Guardian in London, as well as thousands of other news sources and media agencies reported continuously on developments in Ferguson. During the course of the protests and rebellion, the media workers also became targets of the local police with the detaining of journalists from several news agencies and the gassing of a camera crew from Al-Jazeera. 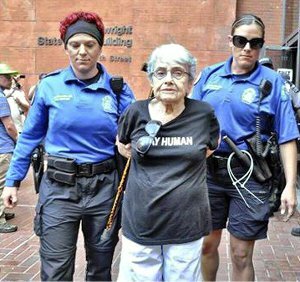 Hedy Epstein, a 90-year-old Holocaust survivor, arrested at a protest in Ferguson, Mo. Epstein was on the boat to Gaza which attempted to break the Israeli blockade in 2011. Another demonstration held on Aug. 30 in Ferguson commemorating the three-week anniversary of Brown’s killing was also covered widely. Thousands gathered to demand that officer Darren Wilson be indicted and arrested in the shooting death of Brown. The demonstration was led by Brown’s parents, Lesley McSpadden and Michael Brown Sr. Protests have been held throughout the U.S. in response to Brown’s killing at the hands of police. The images from Ferguson emanated around the world just days after the U.S.-Africa Summit at the White House and State Department. These developments were covered by the African media and further exposed the racist mistreatment of African descendants in the U.S.
Several governments, press agencies and even U.N. Secretary-General Ban Ki-moon spoke out about the excessive use of force in Ferguson. The rebellion highlighted the ongoing character of national oppression in the number one imperialist country in the world. 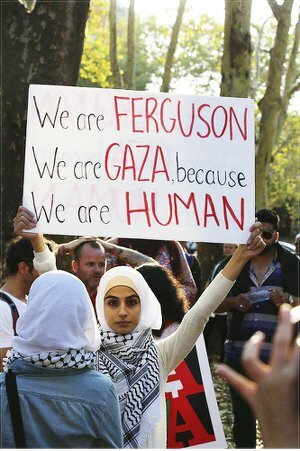 Even the fairly centrist Brookings Institution in Washington, D.C., published a blog written by professor Mwangi S. Kimeroyi, a senior fellow in Global Economy and Development at the University of Nairobi in Kenya, dealing with the situation in Ferguson and its implications for U.S. foreign policy in Africa. Kimeroyi observed that the rebellion in Ferguson could not have come at a worse time for the Obama administration, which was utilizing the Aug. 4-8 summit to try to gain a broader and more positive image of the U.S. in Africa. The newspaper also mocked the government in Washington, which has often criticized Kenya for factional political violence surrounding the disputed elections of 2007-2008. There is continued hostility towards the country by the Obama administration, which did not support the election of the current president, Uhuru Kenyatta, who has a case pending against him and the deputy-president, William Ruto, before the International Criminal Court. The most surprising attacks came from newspapers published in Germany, one of the closest allies of Washington. In two centrist publications, scathing editorials were published on the handling of the Ferguson unrest. 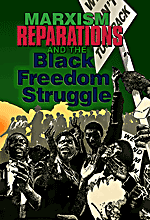 As in the period of the Civil Rights and Black Power eras of the 1950s through 1970s, it is the struggle of the African-American people that has exposed the actual nature of the U.S. political system. The rebellion in Ferguson represents a microcosm of the growing mass sentiment among African Americans, Latinos/as and other nationally oppressed groups as well as working-class people in general. 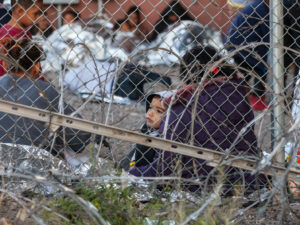 If the U.S. ruling class does not make fundamental reforms related to burgeoning social problems stemming from the declining capitalist system, more mass political actions and rebellions are bound to occur. The corporations and banks, which are running the state from Wall Street, have no response to the escalating discontent other than more austerity, political repression and imperialist war. 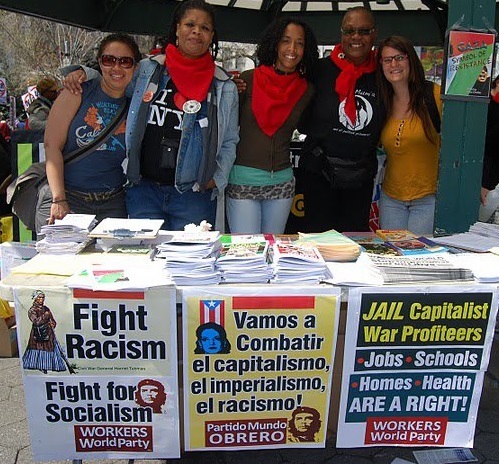 The real solutions must come from the working class and the oppressed, and be expressed through their organizations and movements aimed at total liberation and social justice.